Re: Boxcreater I need help! Just sent PM. did you get it? Wow... that does not seem good. 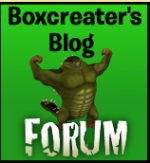 I have regained my password and now I can post on the blog--thnx Box!But one question--am I still an admin on this forum? EDIT It says under my avatar that I'm a co-administrator.But does this mean I can still administrate? Co- Admins mostly Handle the Twitter, or the emails. But I don't have a Twitter,so I can't really handle that. And,um,what emails exactly?Where are they? EDIT:Could there be a group for co-admins?Just so they're recognised maybe? No, not your twitter, the websites twitter, (@telloboxforum) The emails are like the support team. You just send out monthly newsletters, or answer fan questions. And yes, the group idea sounds very interesting, I will tell the developers to add it tommorow. I'll PM you more about the Twitter and email. Hope everything is ok here? "And your sure about this?" Location : Counting my money in my room. Don't worry Orbi,we're totally fine. But BC,how do I send a newsletter? And I have to admit,I am a bit young to be going on Twitter with anyone's account. It's ok if you don't want to do the twitter. Tello can do it. Oh and check your PM I sent you the link on how to get to the newsletter.